We were struck down by an odd and agressive bug last weekend. Bug as in a sickness, not an insect. Just when we were excited to have a fun and relaxing weekend, I found myself in my pyjamas, curled up on the bed feeling feverish. Literally. I took one sip of an evening gin and tonic Dan made me with local Coloardo gin, and the next thing I knew I was down for the count. But let’s not go into details. Basically Saturday was a day to forget, but we made it through the other side, and by Sunday evening we were all feeling mostly 100%. Thankfully, Dan had Monday off from work, so we were able to cram some fun into the last remaining day of the weekend. What does one eat when they’ve just recovered from a GI bug? PIZZA! Obvi. Having already tried the pizza options in our ‘hood, we decided to take advantage of the A/C in the car (it got up to almost 100 degrees!) 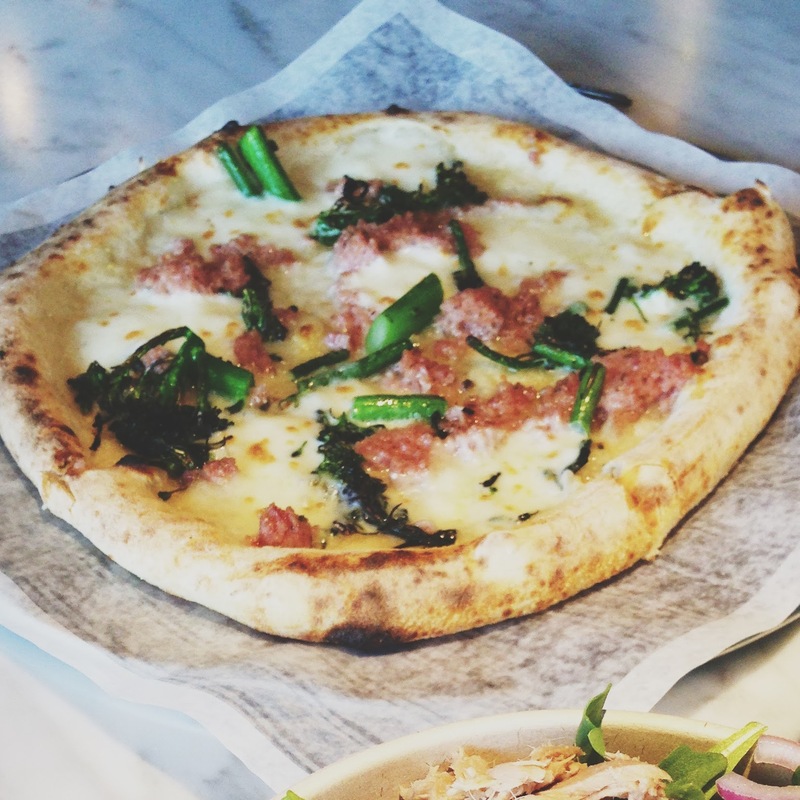 and head to Capitol Hill to try the newly opened Pizzeria Locale. 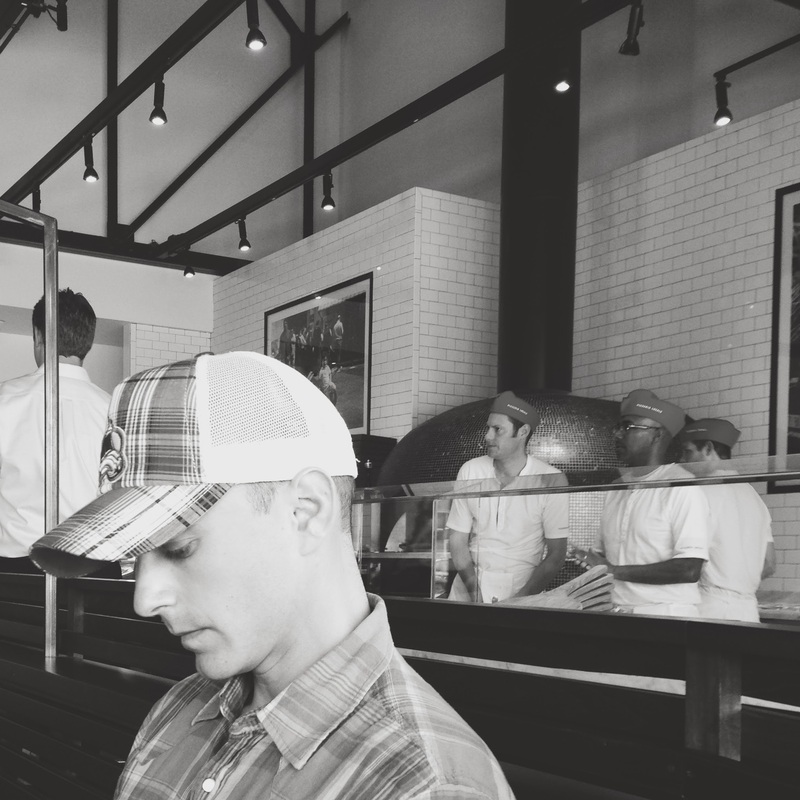 The original opened in Boulder in 2011, but they recently opened a Denver outpost, and word on the street was they have a pizza in and out of the oven in 2 minutes flat. Impressive. Not to mention, fast-casual is ideal for our 11-month-old dining companion. She hasn’t mastered patience yet. We got there right at the lunchtime rush. 12:15ish. The place was full of young professionals enjoying pizzas and sipping fountain sodas. We craned our necks at the menu boards (they were mounted a bit high, I thought, although I am not tall) and quickly decided on a Margherita (tomato sauce, mozzarella, basil), a Bianca (mozzarella, sausage, broccolini, garlic, chili flake), and a Tuna Salad (arugula, tuna, green olives, capers, red onion, grape tomatoes, chickpeas, lemon). And two Peronis. Because after all, we were finally feeling better! They weren’t kidding about the 2 minute thing. I’d barely set up our nice, round, marble table with a highchair before our pizzas were delivered. They were pretty much perfect. The crust was burnt in all the right places. The ingredients were fresh and flavorful. I am usually partial to a white pizza, and the Bianca did not disappoint. The broccolini was so good. Willa gobbled up her fair share. And sausage! Who doesn’t like sausage. It was just the right amount of spicy. Dan enjoyed the Margherita too. Gotta have tomato sauce, he says. There wasn’t enough basil on it for my liking, just a leaf thrown here or there. I prefer chopped basil. Spread it out! Share the love! Maybe the best part about Pizzeria Locale was the atmosphere. I’m a sucker for subway tile, and man, does this place have subway tile. And the hexagon tiled floor. Swoon. The space was bright and airy, and it felt friendly, even with all the fancypants professionals around. They cleared out right around 12:50pm, and we had the place more or less to oursleves. The staff was really nice (“Thanks for coming in!”), although when we ordered we had to tell a different guy each item (one pizza guy, one salad guy, one drink guy, and a cashier). Seemed a bit overkill. Most importantly, the pizza. So good. The prefect way to revive our tastebuds after a day or two of nothing but crackers and water.